Happy Birthday to new Tennessee Sports Hall of Fame umpire Chuck Meriwether, inducted this month. Julius "Chuck" Edward Meriwether, born June 30, 1956, officiated his first Minor League game in the Midwest League in 1979 after attending the Wendelstedt Umpire School, and worked his way through the Eastern League, Pacific Coast League, and American Association, before his promotion to Major League Baseball. A former collegiate first baseman, Meriwether has a Bachelor of Science degree in Health and Physical Education from Athens State College and became an umpire after seeing an ad in the paper for umpire school. Meriwether calls a runner out at second base. He called his first Major League game on May 23, 1987, working his final game 23 years and 2,594 games later in 2009 when, according to Meriwether, his knees forced a decision to retire. He recorded 28 ejections during the course of his career, and was selected to two All-Star Games (1996, 2002), eight Division Series (1998-2002, 04, 07, 09), two League Championship Series (2003, 06), and two World Series (2004, 07). Since his retirement following the 2009 season, Meriwether has served as a Major League Umpire Supervisor. 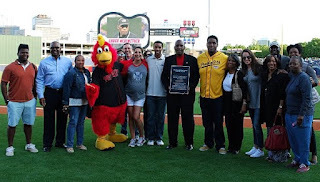 In 2016, the Nashville Sounds renamed the umpire room at First Tennessee Park the Chuck Meriwether Umpire Room, in his honor. Meriwether video (Bobby Cox ejected by Eric Cooper, Narrated by Vin Scully) via "Read More"